The WICT Southeast Mentoring Program facilitated a wonderful workshop for students and entry-level workers on March 29, 2012. The name of the workshop, “Get That Interview!” aligned perfectly with the goals of all who attended. Knowledgeable mentors graciously shared their advice and experiences. The workshop was made up of 3 parts: Resume Review, Interviewing Tips & Techniques, and Get Professional with Social Media. “Get That Interview!” began with a presentation by Lucie Shiff of Lucie Shiff Consulting. Lucie focused on the Ups and Downs of Elevator Speeches. Great tips were given on how to differentiate yourself from the crowd. Personalizing your elevator speech can be the difference between a successful and unsuccessful networking opportunity. By eliminating unnecessary words, you can create strong, powerful sentences to elevate your elevator speech. 2. Tell who you are. 3. Tell what you do with enthusiasm. 4. Tell what problems you have solved. 5. Offer vivid examples, one they can relate to. 6. Tell why you are interested in the listener. 7. Tell what very special service, product, or solutions you can offer. 8. What are the advantages of working with you? 9. Give a concrete example of uniqueness. Personalize it! Differentiate! 10. What is the desired outcome? Card? Referral? Interview? Presentation? Tonya Butler and Candice McLemore headed the “Interview Tips and Techniques” table. Together, these mentors emphasized the importance of researching the company you are interviewing with as well as the importance of practicing with mock interview questions. 1. Practice 10 – 15 questions to ask the interviewer. You can focus on the culture and direction of the company. 2. Most interviewers are focusing in on the qualifications, then the summary, and lastly the objectives of the job posting. 3. Express unique things about you. 4. Recommended reading: “Power Phrases”, “How To Say It For Women”, and “101 Interview Questions”. 5. Feel free to pause before answering a question during an interview. Pausing can be a sign of maturity. 6. Learn and understand the company values. 7. Past performance predicts future events. 8. Practice the S.T.A.R. interviewing technique. 9. Research behavioral and performance based interview questions. Lucie Shiff and Dirk Smith led the Resume Review table. As resumes were passed around, Dirk and Lucie evaluated each page and gave specific improvement tips. These two gave outstanding advice on how to make your resume standout. 1. Make it standout. The reader could be burned out while looking at resumes. Make them remember you. 2. List volunteer experiences that make you special. 3. Know what you’re looking/applying for by job title and core skills. 4. Make it easy for the recruiter, be the solution to their problems. 5. Read multiple postings, from different companies, of the same job title to get a better understanding of the core skills necessary. 6. Be the solution and add value. 7. Always be as quantitative as possible. For example, I saved $5,000 over 6 months. 8. Use action verbs from the job description. 9. Make result oriented points. 10. Eliminate the words assisted and supported from your list of action verbs. 11. Make your resume readable. In as few words as possible answer this question: How can you help me solve my problems? 12. Don’t use any acronyms that are not common knowledge. 13.Stray away from paragraphs. Use bullet points for each experience. Your work history should go back 10 years. Social Media in the workplace can be a touchy subject. Do we really need to censor our posts? Sharon Cohen and Katrina Milam teamed up to head the Social Media table. Together they explained the benefits of having professional social media pages. 1. Social media is another source for reaching targeted audiences. 2. Take something you already do for fun, and make it work for you. 3. Share what you’ve learned with your peers. 4.Ask your questions and get answers, without the run-around. All in all, the “Get That Interview!” event was amazing and all attendees went home with priceless information. Each mentor was down-to-earth and willing to share any information that would help the attendees succeed. Events such as this one are absolutely necessary in the evolving world of communications. I would personally like to thank the mentors who took time out of their busy schedules to lend a helping hand. A very special thank you to Jamelia Smith and Kate Silva for coordinating this event! 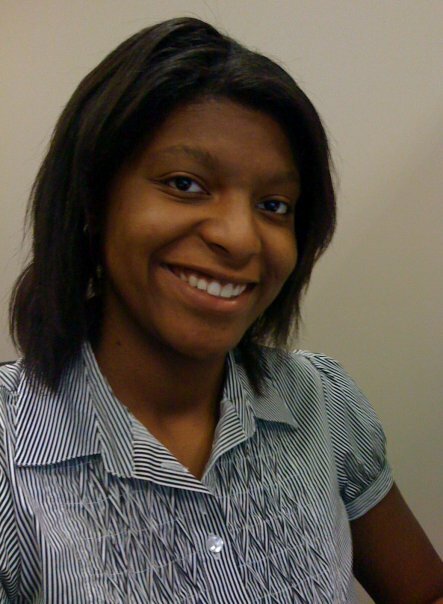 Jasmine Weatherly currently works at Turner Studios as Support Staff for the Editorial Department. Jasmine is a proud alumnus of the Howard University class of 2010. She has interned at a variety of companies such as NBC 4 Washington, Georgia Public Broadcasting, WHUT, and The Wolf Trap Foundation for the Performing Arts. Her favorite part of the TS&O and WICT Mentorship Program is the inspiration she gets when learning about the many different paths that mentors have taken down the road of success.